Church of Scientology of California. Hardcover. 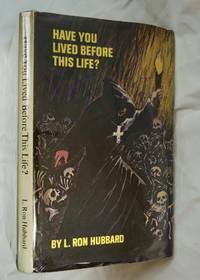 0884040046 Have You Lived Before This Life? : A scientific survey : A study of past lives through Dianetic engrams by Hubbard, L. Ron; green cloth Hardcover w/ bright gilt titles in Near Fine unclipped dust jacket in new archival mylar cover; Church of Scientology of California (1968); First Edition; Third printing; tight clean copy; Also includes original 1976 paper receipt for the book from Church of Scientology in Charlotte, N.C. in excellent condition; 0884040046 ISBN 13: 9780884040040 . Fine. First Edition. Clark Publishing. PAPERBACK. 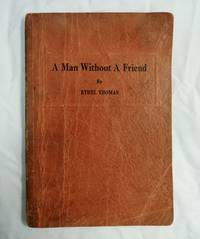 B01LZ2JHXJ First Edition; A Man Without A Friend by Ethel Thomas; Clark Publishing (1930) Paperback; Southern Textile Cotton Mill Work Farm Life; The author, Ethel Thomas, worked for a textile mill trade newspaper from many years and authored fourteen novels between the years 1913 and 1950. Most of the novels concern the Southern textile mills, villages and mill workers who formed her readership and are strongly anti-union in tone. All of her books are very rare and impossible to find. They were published in Charlotte, North Carolina - by Clark Publishing Company. Clark publishing was the only distributor that sold these books. The publishing company she had worked for, was sold to another company in the early 1970s, and all of the remaining copies of her books were sent to a landfill and destroyed. historical fiction, North Carolina. This title begins with a convict camp outside of Atlanta. 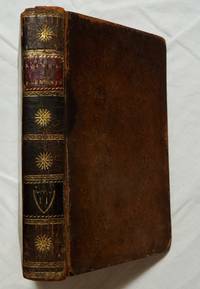 Brown softcover in Good+ condition; small nick to bottom edge of spine back; 96 pages; scarce . Good. First Edition. 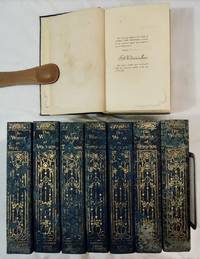 G. P. Putnam's Sons / Knickerbocker Press. Hardcover. B0077C4JX8 The Works of Alfred Lord Tennyson (Centenary Edition, Eight Volumes, Complete) Tennyson, Alfred Lord; Published by G. P. Putnam's Sons / Knickerbocker Press, NY and London (1909) forest green cloth hardcovers in Good condition with some surface wear & dampstained page edges; Limited, numbered, and signed edition (No. 458 of only 1000 copies; ex-libris plates printed on feps (all blank), tissue-protected color frontispieces. Illustrated with numerous tissue-protected sepia plates throughout by Gustave Dore and Frederick Simpson Coburn. Preface by Elisabeth Luther Cary with Introductions to each individual volume by various authors. ; interiro pages bright and clean; front and rear endpapers and boards dampstained; complete set worthy of re-binding; scarce . Good. Hearst. SINGLE ISSUE MAGAZINE. B07L9J3DQP Hearst's International combined with Cosmopolitan Magazine September 1936 - First Printing of Ernest Hemingway's "The Short Happy Life of Francis Macomber" which is the first story in the author's famous collection of short stories; Bradshaw Crandall good girl cover art; bright beautiful cover with no address label; small neat number stamp to cover corner; 'Special Vacation Issue'; interior is illustrated in color; full color Coke ad to inside cover; An excellent gift for the Ernest Hemingway or First Edition collector; A great example of prime 20th century American fiction; Original magazine in Very Good+/Near Fine condition; scarce . Very Good. Houghton and Mifflin, Boston, MA. Hardcover. Epaminondas And His Auntie by Bryant, Sara Cone; Hogan, Inez (illustrator) Published by Houghton and Mifflin, Boston, MA (1938); illustrated brown cloth hardcover; ex church library small stamps to board & endpapers, card pocket, no spine stickers; some speckled foxing to inside covers; bright clean pages with lovely colorful illustrations; A story about a young African American boy that misunderstands his Auntie's directions every time he visits her, leading to many mishaps and an angry mother. Bryant's stories, including this one, have been criticized for their racist overtones and stereotypical characters. This book was first published in 1907. Americana, African American . Very Good. E. P. Dutton. Hardcover. 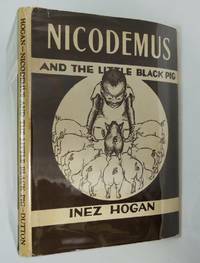 B00BLBVCCW Nicodemus and the Little Black Pig 1954 by Inez Hogan; original illustrated Very Good+ Hardcover in rare original unclipped dustjacket in new archival mylar cover in Near Fine condition ; E. P. Dutton; former church library with no pocket, no spine stickers, only a few small neat stamps to boards and endpapers; a beautiful copy; First Edition; 17th printing. ; square solid copy with bright clean pages; scarce. Americana, African American . Very Good. First Edition. E.P. DUTTON & CO., INC.. Hardcover. 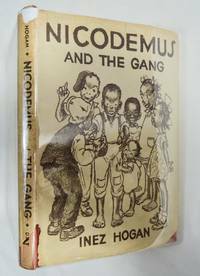 B000OK61P4 Nicodemus and the Gang 1953 by Inez Hogan; First Edition; stated third printing 1953; E.P. Dutton Co.; original orange illustrated buckram hardcover; includes the very scarce original unclipped dustjacket Good+ condition with some chipping to spine ends, in a new archival mylar cover; ex-library with no pocket, no spine stickers; only small neat school stamps to inside covers & endpapers; square solid copy; bright clean pages; tight copy gently read; Americana, African American; scarce . Very Good. First Edition. A. Millar & R. & J. Dodsley. Hardcover. 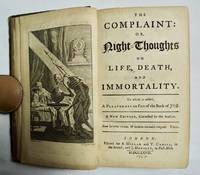 B0012DSDG2 The Complaint: Or Night Thoughts on Life, Death and Immortality, To Which Is Added, A Paraphrase On Part Of The Book Of Job; Full leather Hardcover; by Dr. [Edward] Young; Published for A. Millar & R. & J. Dodsley, London; Original 1768 publication; engraved frontispiece of a skeleton; tight copy with very light toning; a little chipping to spine bottom; square handsome copy; scarce . Very Good. D. Appleton & Company, NY. Hardcover. 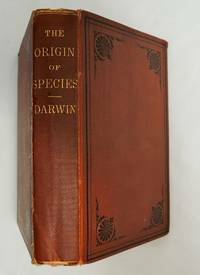 Darwin, Charles; On The Origin Of Species By Means Of Natural Selection, Or The Preservation Of Favored Races In The Struggle For Life Fifth Edition with Additions and Corrections; brown cloth Hardcover with bright gilt titles; 1870 D. Appleton & Company, NY; mildly rubbed corners; spine edge split repaired to back edge; bright lean pages; some Japanese text to inside cover; two pieces of clear archival tape to ffep; nice vintage Charles Darwin color picture sticker affixed to ffep; Good+ condition; a very early copy of this classic work of natural history and science; All early editions of this title are scarce . Good. 1871. Artabras. Hardcover. 0896592537 Audubon's Birds of America Baby Elephant Folio Deluxe Leather Edition; Peterson, Roger Tory & Virginia Marie; 1981 Published by Abbeville Press, NY; The full collection of Audubon's bird paintings beautifully reproduced. Further illustrated with many other color and black & white photographs. 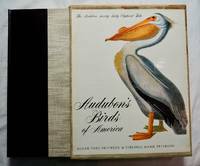 Thick folio, 1/4 black leather over linen; Includes original linen slipcase in VG condition with spot to one corner of slipcase not affecting color title plate; clean handsome copy with bright gilt titles; 15.25" x 12 inches; indexed; birds, ornithology, birding, art. . Fine. SINGLE ISSUE MAGAZINE. 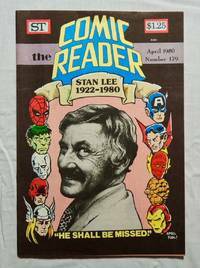 B01133YJ3G COMIC READER 179 Classic STAN LEE 1922 - 1980 Memorial PHOTO cover - April Fool's joke cover; NM condition; comic books, graphic novels, artists . Fine. NFL Football. PAPERBACK. 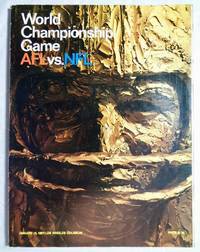 B07GDVVJ91 Original First Super Bowl Program Book - World Championship Game AFL-NFL 1967; The original program to the first AFL-NFL World Championship Game - later and better known as "The Super Bowl" played January 15, 1967 at the L.A. Memorial Coliseum in Los Angeles, California. Legendary head coach Vince Lombardi and game MVP Bart Starr, both future Hall of Famers, led the Packers to the first-ever Super Bowl championship over Lamar Hunt ? founder of the AFL and the Kansas City Chiefs. Spectacular NM condition makes this one of the nicer surviving examples of this historic and severely undervalued gridiron collectible and the finest we have ever handled. Stored in an acid-free magazine bag. Complete and original, vintage Super Bowl programs are wonderful snapshots of American sports history and rarely seen in such high grade. The book is in Near Fine condition with no writing; small mark to cover, mild edgewear and light crease to one back cover corner; Approx. 10 3/4 by 8 1/4" and has 144 numbered pages. It has a foldout page opposite the title page; It includes articles, statistics and other information about all the teams and players in both leagues, color and black and white photos from the season, as well as many ads. A real treasure for the NFL Football fan. Very scarce original collector's item! . Fine. First Edition. Pirate Editions, NY - Grove Press. PAPERBACK. 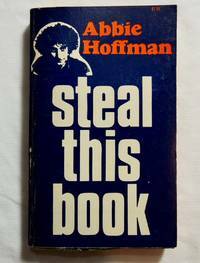 Steal This Book by Hoffman, Abbie; & Haber, Izack; Forcade, Tom; Cohen, Bert Published by Pirate Editions, NY 1971; First Edition; First Printing; blue paperback with white & orange titles; edgewear; solid spine; mild toning; clean, tight, square copy; scarce hippie counterculture book distributed by Grove Press; Abbot Howard 'Abbie' Hoffman (1936-1989) was an American political and social activist and anarchist who co-founded the Youth International Party ('Yippies'). He was arrested and tried for conspiracy and inciting to riot as a result of his role in protests that led to violent confrontations with police during the 1968 Democratic National Convention . Very Good. 1971. First Edition. Published by Haines & Diefenderfer, Printers, "Register" Office, Allentown, PA.. Hardcover. 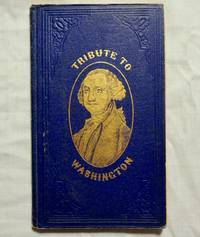 A Tribute to the Memory, Character and Position of Washington the Father of American Independence with a Biographical Sketch of His Beloved Wife Martha Together with Chateaubriand's Interview with Washington, A Poem Entitled The Dawn of Liberty and a Beautiful Couplet on Seeing His Grave at Mount Vernon; by Soper, Thomas; Published by Haines & Diefenderfer, Printers, "Register" Office, Allentown, PA. 1858; slim blue blind stamped cloth hardcover with bright gilt portrait of George Washington to cover and gilt titles; 48 pages - Size 7" x 4.25"; tight copy in Near Fine condition with light edge wear; bright clue covers; pages lightly toned; beautiful contemporary gift inscription to ffep dated 1858; The author, Thomas Soper was blind yet managed to publish this rare work honoring George Washington; Very scarce; Americana, history, Revolutionary War, politics, blindness, United States. . Fine. 1858. First Edition. Halae, Sumptibus Orphanogrophei. LEATHER_BOUND. 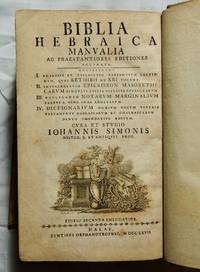 Biblia Hebraica Manvalia ad Praestantiores Editiones Accurata; Simonis, Johannis; Published by Halae, Sumptibus Orphanogrophei (1767); Hebrew Bible - Hebraica Torah + Manual Judaism Judaica Johann Simonis; leather bound hardcover with chip to spine top corner; square, solid, tight copy; mild toning to text; illustrated with beautiful woodcuts throughout; scarce . Very Good. 1767. Harcourt, Brace & World, NY. Hardcover. 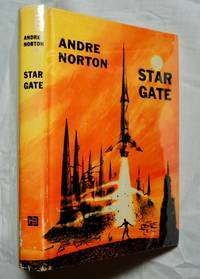 Star Gate by Andre Norton 1958; Original yellow cloth hardcover in Good ex-library condition with bright beautiful Richard Powers Cover Art on Very Good+ clipped dustjacket in new archival mylar cover; Harcourt, Brace & World, NY 1958; First Edition with 'FGHIJK' on copyright page; Richard M. Powers (illustrator) . Very Good. 1958. First Edition. Chas. P. Young Co., printers. Hardcover. 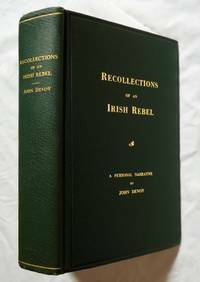 B00086MTO6 Recollections of an Irish rebel; the Fenian movement. Its origin and progress. Methods of work in Ireland and in the British army. Why it failed to achieve its main object but exercised great influence on Ireland's future. Personalities of the organization. The Clan na Gael and the rising of Easter week 1916. A personal narrative. green cloth Hardcover with bright gilt titles in Near Fine condition with the rare brown paper dustjacket; dj is unclipped with open tear to spine and upper edge in new archival mylar cover; small neat gift inscriprion to ffep; by John Devoy (Author) Published by Privately Printed By Estate of John Devoy, NY; Chas. P. Young Co., printers 1929; First Edition; Also included: An original copy of "The Daily Hibernian June 1945" in Very Good + condition laid-in; Handsome copy; Irish, Ireland . Fine. First Edition. Samuel Etheridge. Hardcover. B005KDEVZM Elements of Criticism with the Author's Last Corrections and Additions 1796 Samuel Etheridge, Boston; (volume 2 only) full leather hardcover with gilt titles; front hinge cracked; square copy; Widely known classic in the field of aesthetics, in which he codified the Lockian "ideal presence." Includes chapters on Perceptions and Ideas, Emotions and Passions, Beauty, Grandeur and Sublimity, Novelty, Congenity and Propriety, Dignity and Grace, Ridicule, Wit, Custom and Habit, Sentiments, Language of Passion, Beauty of Language, Epic and Dramatic Compositions, Gardening and Architecture. 440 pp; indexed; clean text with some speckled foxing; scarce . Good. J. Grigg. Hardcover. 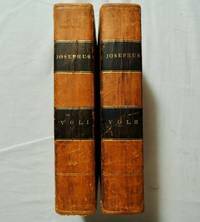 B005658K5G The Works of Flavius Josephus (2 volumes) Whiston, William; Published by J. Grigg, Philadelphia 1829; Full leather hardcovers with bright gilt titles; bright clean pages; square solid copies; a little edgewear to covers and light page toning; a clean handsome set in Near Fine condition; "The learned and authentic Jewish historian, and celebrated warrior, containing twenty books of the Jewish antiquities, seven books of the Jewish War, and the Life of Josephus, written by himself. Translated from the original Greek, according to Havercamp's accurate edition. Together with explanatory notes and observations, embellished with elegant engravings. "; Jewish Warrior - Ancient History of Christianity; . Fine. Harper & Brothers. Hardcover. 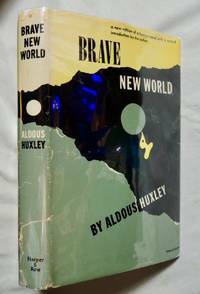 B00MU2AO66 Brave New World by Aldous Huxley; Harper & Brothers; Very Good+ black cloth hardcover with bright gilt titles with lightly rubbed corners; small ding to back cover edge; clean copy in Very Good dustjacket designed by E. McKnight Kauffer with closed tear to spine bottom and some chipping to spine top in new mylar cover; VG+; 1946 Edition; bookclub; . Very Good.